L*Space Cover-Up Wrap – I love this wrap because you can wear it open or closed. It’s a little $$ for a cover-up but I like that you can wear it two ways. Shop Smart Tip: Winners and Marshalls have some great cover-ups at an affordable price if you’d rather save on an item like this. 2. Gap Panama Resort Hat – Gap always has fun and trendy hats for under $40 which is so great when you’re traveling because you don’t have to worry as much if it gets damaged. 4. Ella Moss The Lover High Neck Top & Bottom – Bathing suits are extremely personal and can be hard to shop for unless you are able to try it on in the store. These days I’m all about COVERAGE and I think this suit is the answer for a sleek and sophisticated look at the pool. 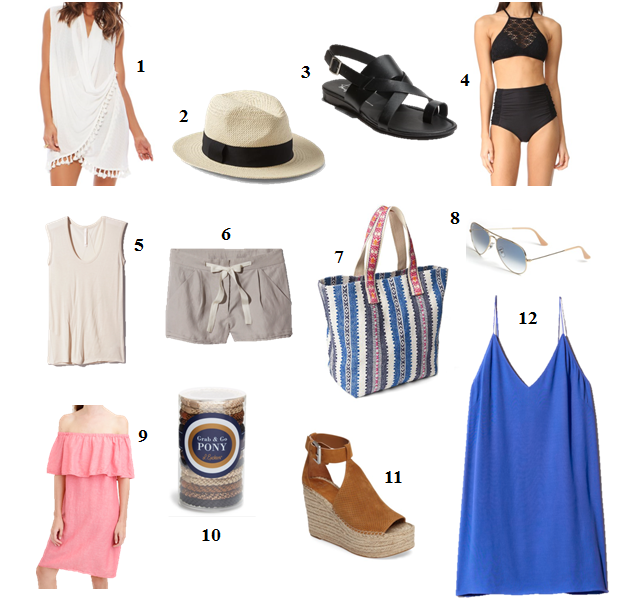 Shop Smart Tip: SHOPBOP really has the best swimwear collection! Right now they are having their big promo on until Saturday, March 4th at 11:59pm PT. Use code GOBIG17 for 15% off $200+, 20% off $500+ and 25% off $800+ (on full-price and sale items). 5. The Group by Babaton Kepley Tank (birch) + 6. Wilfred Allegra Short (ashen) – When I’m on vacation somewhere warm I like to wear a comfortable loose tank and shorts combo so that I’m covered up if I’m walking around town, shopping, or grabbing lunch at a restaurant. 7. Gap Print Large Tote Bag (moore blue) – For the most part I don’t wear a lot of print clothing unless it’s pretty basic and toned down…but for a fun beach bag I’m all about a loud or busy pattern. This bag is a good size and can easily be carried over your shoulder. It doesn’t have a ton of compartments but I travel with my own mini compartment bags so I can easily transfer them from the diaper bag to beach bag to my airport carry on. 8. Ray-Ban Original Aviator Sunglasses (gold/blue gradient) – Struggling to pick out a new pair of shades? Well, I honestly don’t think you can go wrong with Ray-Ban’s classic original aviator sunglasses. They come in a wide variety of (frame/lens) color combinations. 9. J.Crew Off-the-Shoulder Dress – If you scoop this dress you’ll definitely want to size down. It’s pretty big with not a ton of shape…but that’s just the way I like it. Technically it’s a “cover-up” but I see myself wearing this to a resort cookout for dinner or something fun like that and pairing it with wedges to dress it up a bit. 10. L. Erickson Ponytail Holder (neutral metallic) – What I love about these hair elastics is that they’re strong, durable, and don’t damage your hair unlike others. As someone who sports a ponytail a lot and has thick hair…you’ll want to try these. They also look a little nicer on the wrist when you take your hair down. 11. Marc Fisher LTD Annie Perforated Espadrille Platform Wedge (cognac suede) – I’ve been seeing these platforms around everywhere and I couldn’t resist including them. I always pack platforms on vacation because I’m usually on a boardwalk or grass or sand, and they’re easier for me to walk in vs. high heels. 12. Wilfred Free Vivienne Dress (gentian blue) – I think this slip dress is so pretty in the bright blue colour. I love that you can layer it with a fitted top underneath or wear it on its own. Nice resort wear with wonderful accessories. Resort wear is specially made for the female gender.